My children both adore animals. Unfortunately, we live in a small two bed rental home with no garden so having any real pets of our own is a no-no. 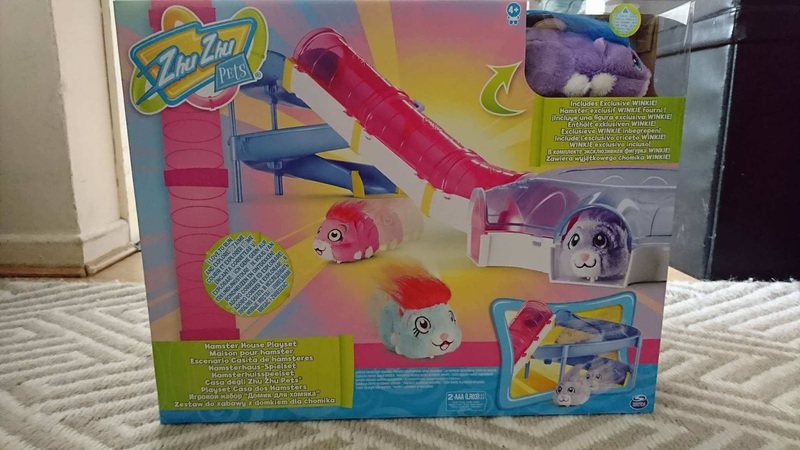 To my children's delight, toy pets exist and they were thrilled to see what it was like to look after their Zhu Zhu Pets. As soon as we opened the parcel, the children were so excited to get playing. 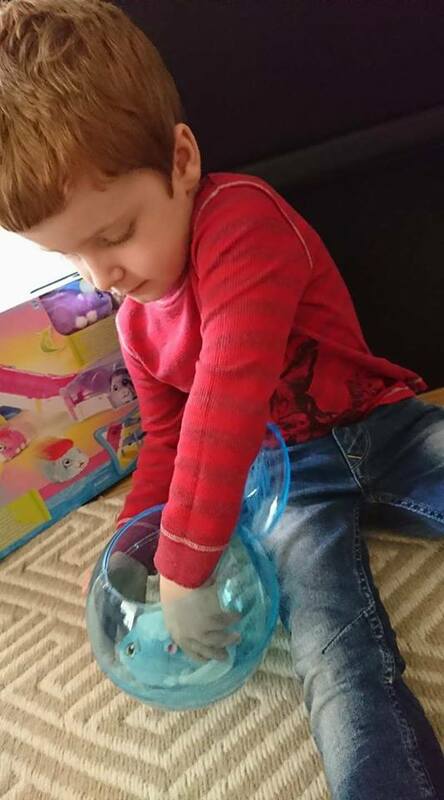 Chunk the hamster is quite big so is perfect for little hands to play with. They come with batteries so all you need to do is push the button on it's back and watch it scuttle off! The Zhu Zhu Pet hamsters make noises too and their movements are random so you just don't know what it's going to do. The sensors mean that when they bump into things, they can turn themselves around and keep going. E kept exclaiming, "It's so cute! Look at it's pretty hair!" The little tuft on top is pretty adorable and she loves that he is soft and fluffy just like a real hamster. 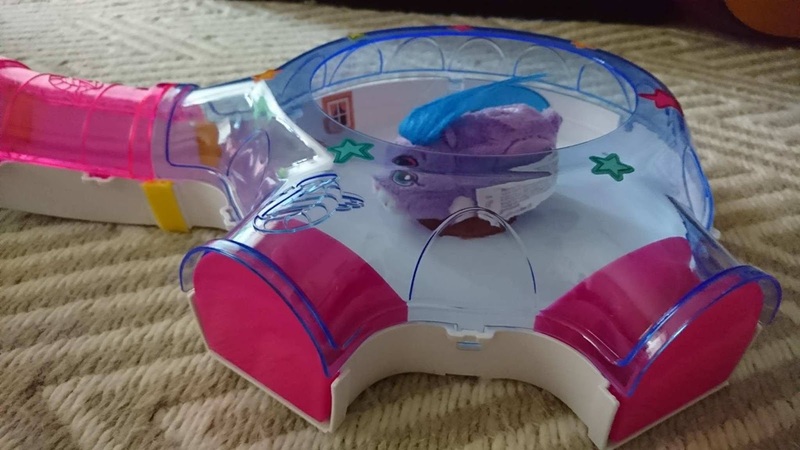 The Adventure Ball is a great accompaniment to the individual Zhu Zhu Pets. 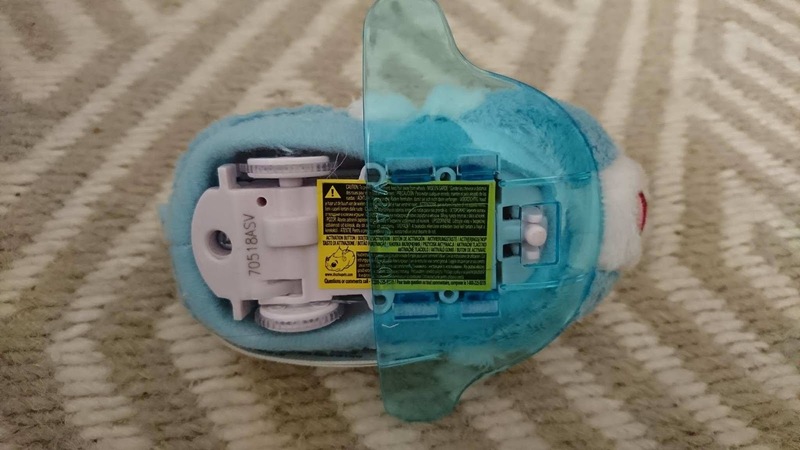 It includes one piece of plastic that you clip onto the bottom of the Pet before placing it into the ball. The ball itself is pretty easy to clip together but don't leave it near a boisterous almost-3-year-old! She managed to crack it a little but it's nothing a bit of glue didn't fix. She now knows to leave mummy to open and close it! The sets are recommended for age 4+ so it's worth going by that or supervising younger children. 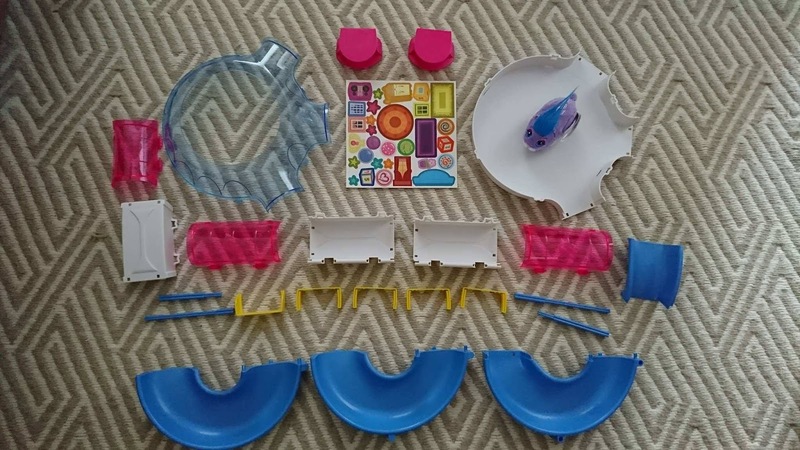 The ball has a little "door" so you can put the hamster in or take it out so really there is no need to take the ball apart once it is built. 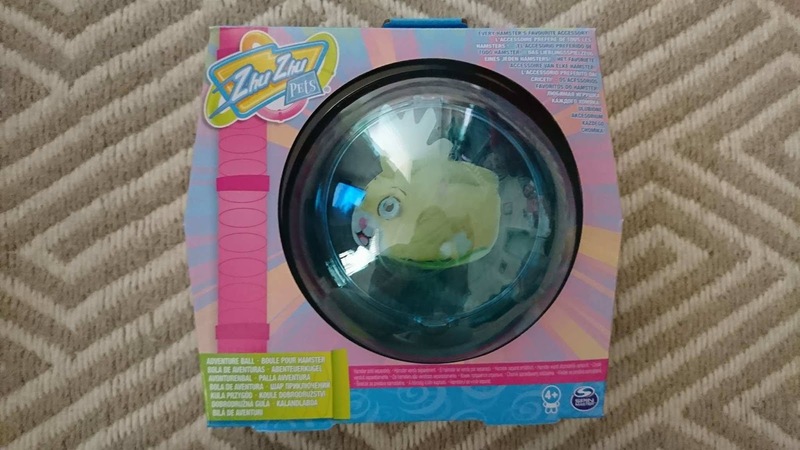 When inside the ball, the Zhu Zhu Pet will run around just like a real hamster in an exercise ball. 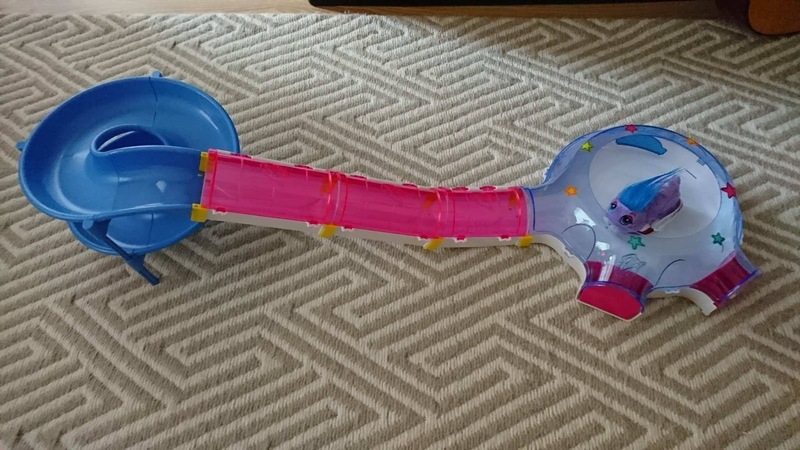 The kids prefer using this over leaving the hamster to roam free around the floor as it can't get stuck under the sofa! The Hamster House Playset was a massive hit with C and E. It took a little instruction reading and building but all in all, it was easy enough to get right. The children were very excited to decorate it any way they wanted with the stickers that were included. You get the main base area where the hamster starts off. There are three openings but included are two yellow stoppers so if you only want the hamster to go up the slope and not escape out the two side parts, you can block them. The slope attaches to the base area then clips into a helter skelter type part. When you place the Pet into the base part and press the button, it will find its way up the slope then back down to the ground. The slope has three opening lids and if they aren't clicked closed, the hamster can pop its head up. They do need to be closed fully for it to continue its journey smoothly. The Hamster House Playset comes with a hamster too (the exclusive Winkie) so we had no fighting over them. They enjoyed playing with them together and letting them take turns in the Adventure Ball and Hamster House Playset. I think the fact that the Zhu Zhu Pets are so unpredictable was a source of excitement for the children. They both let out squeals and giggles when the hamsters ran off. We absolutely love playing with them and they are a great idea for people who can't have pets or for practice before getting a pet! The Zhu Zhu pets are available in four different characters and are £12.99 each. 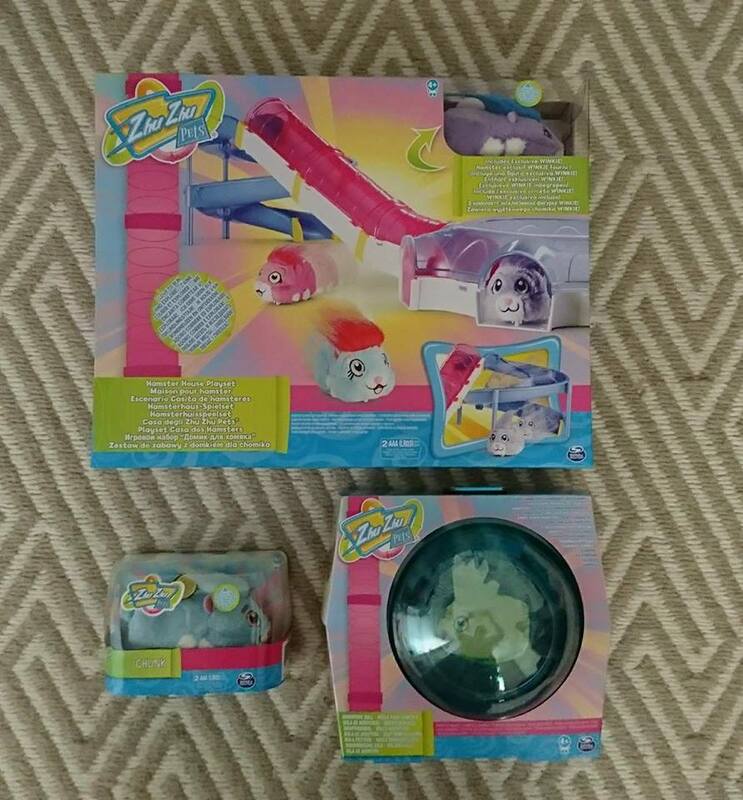 The Adventure Ball can be purchased for £9.99 and Hamster House Playset for £29.99. 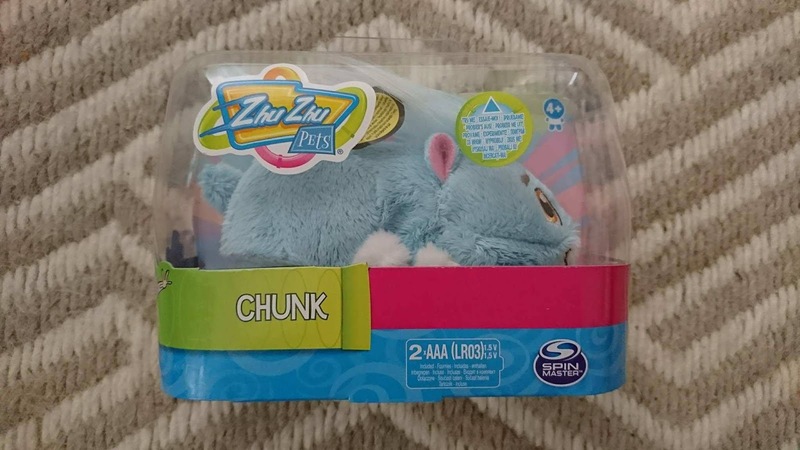 The range of Zhu Zhu Pets toys can be purchased from all major toy retailers.